I married my wife four years ago on this day. No other relationship, except for my relationship with Jesus Christ, has been more significant or life-changing than the one with my spouse. I love her with my whole heart. So on our fourth anniversary I share four reasons why I married my wife. We are complete opposites/ We complement each other. Janee’ and I recently took the Myers-Briggs type inventory. It’s a personality test that groups people into sixteen different types based on four characteristics: Introvert/Extravert, Sensing/iNtuitive, Thinking/Feeling, Judging/Perceiving. My type is ENFP and hers is INTJ. We are the exact opposite in almost every way, and we’re perfect for each other. Where I am easily excited, she is logical and deliberate. Where she is focused on the here-and-now, I take a longer view of things. Whereas I can over-think an issue, she is decisive. Sure, being so different from your spouse can be difficult. Actually, it can be incredibly frustrating at times because we process life so differently. 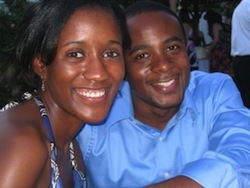 But we complement each other in the best ways, and for that I love being married to Janee’. Meeting Janee’s parents for the first time gave me confidence that she was the right girl for me. I could tell by the way her folks spoke to me, welcomed me, and treated their daughter that we had a lot in common. I think our culture’s emphasis on individuality and personal choice devalues the role of each spouse’s family. When you get married you are grafted into another family and your mate is likewise sewn into yours. Even though someone’s parents ought not to be the determining factor in whether a couple gets married, it is important to consider. I am glad that my wife’s parents and mine raised us similarly. Our families each value education, were strict about instilling some “home training” in their kids, and had parents who stayed together even when it was tough. These similarities have made it easier for Janee’ and I to build our own household. I know not every couple is blessed with agreeable in-laws, and I wish you very much patience. I am simply grateful that Janee’s parents provide yet another reason I married my wife. My wife has always encouraged me to be adventurous. Even though I can be risk-averse by nature, whenever I’ve presented her with a bold idea or a new plan, she has always given me the sense that I can do anything. I’ll always remember how supportive she was when I suggested that we move to Jackson, MS so I could resume my seminary studies. This move would mean leaving my job as a principal, foregoing the highest salary I’d ever had, and re-locating even farther away from our families. All of this had to be done as we figured our how to care for our first child who was still an infant. As the years have progressed, I’ve come up with more crazy ideas and she has always affirmed me. Yet she has never even hinted that she is dissatisfied with who I am right now. She knows better than anyone my flaws and imperfections. She always challenges me to get better, but she never makes me seem like I am inadequate or that I disappoint her. She loves me for who I am. I cringe a little whenever I hear someone say, “I love my spouse more than anything or anyone else.” There’s a sense in which this is true, of course. You should love your husband and wife more than any other person. But the danger is making your spouse the center of the universe. Jesus is at the center of Janee’s world. I remember reading her Facebook profile before we got married, and I knew that I could marry her when I saw that she quoted 1 Peter 3:3-4, “Do not let your adorning be external—the braiding of hair and the putting on of gold jewelry, or the clothing you wear—but let your adorning be the hidden person of the heart with the imperishable beauty of a gentle and quiet spirit, which in God’s sight is very precious.” Many women like to look good on the outside because that’s what the culture values. My wife wants to dress up her soul because that’s what God values. I am human. I will fail my wife many times and in many ways. The only person who will never fail her is Jesus Christ. I know that as long as she clings to Him more than me she won’t be devastated by my failures, and she’ll always have someone who loves her even more than I do. Maybe you’re still searching for your spouse. Perhaps you’re engaged and anticipating what your new life will look like. Or you could be celebrating yet another anniversary. Whatever your relationship status, I encourage you to think of the people you love and recount often the many reasons why you love them. Share Your Thoughts: What’s the first reason that comes to mind when you think of why you married your spouse or chose your significant other?